In our commitment to help you find products that can safely and effectively protect your skin, we’re presenting this list of the best sunscreens for sensitive skin that are highly rated in the market today. We’ve spent almost 22 hours of intense work studying products for their SPF level, compatibility with sensitive skin and added skin benefits- without ruining your budget. Neutrogena Sensitive Skin Sunscreen Lotion offers a high SPF 60 rating. Its primary ingredients are titanium dioxide and zinc oxide, which are both considered fit for sensitive skin. For a dewy finish that isn't oily, Vanicream Sunscreen for Sensitive Skin is a good sunscreen to add to your vanity. It offers SPF 30 and a formulation that's free of irritating ingredients. Olay Complete Daily Defense All Day Moisturizer for Sensitive Skin is infused with vitamins so that your skin isn't only protected, but nourished, too. It's lightweight and dermatologist tested to ensure that it won't harm your vulnerable skin. Blue Lizard Sunscreen Sensitive﻿ has a wide range of sunscreen to fit almost every skin type. This sunscreen for sensitive skin provides good coverage without the risk of triggering allergies. Here, all the info you'll need to track down the best sunscreen for sensitive skin. Apart from being fragrance-free and hypoallergenic, Neutrogena Sensitive Skin Sunscreen Lotion also has antioxidants and anti-irritants. It’s 100% naturally sourced, too. The active ingredients you can find in this sunscreen are gentle. To be specific, they are titanium dioxide and zinc oxide. The actual product isn’t heavy on the skin. It’s actually kind of interesting since it doesn’t leave a long white cast. Its texture is a bit mousse-like. It goes on smoothly but can take awhile before it gets fully absorbed. As for sun protection, it offers a high SPF 60 level that can work well against UVA and UVB. It is water-resistant but you may still need to reapply 80 minutes after sweating or swimming to ensure continuous protection. 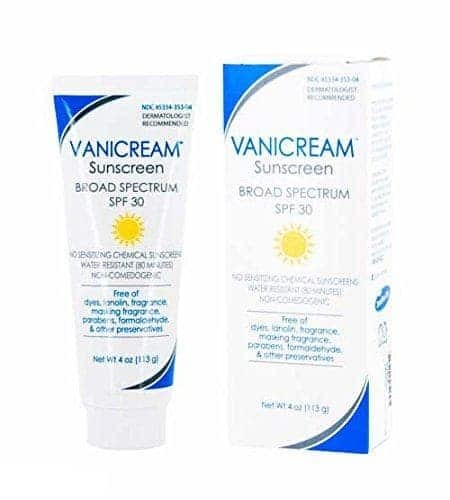 Dermatologist recommended, Vanicream Sunscreen for Sensitive Skin is noncomedogenic. Aside from the property, this one is also packed with antioxidants to prevent the free radical damage caused by excessive exposure to the sun’s harmful rays. It’s a bit thick and feels tacky which means it can take more time to really get the product into your skin. Once blended, it won’t feel heavy or bothersome. In fact, it can leave a dewy shine on your skin. Nope, it’s not oily- just dewy. The product is free from lanolin, dyes, fragrances and other ingredients that mask scents which is really nice for sensitive skin. Olay Complete Daily Defense All Day Moisturizer for Sensitive Skin can’t only protect you against the sun’s harmful rays. The product is also packed with vitamins E and B3 to instantly soothe and nourish your skin. Apart from that, it’s also lightweight. You won’t have to worry about your skin feeling tacky or heavy when you’re outdoors. And if you have acne-prone sensitive skin, this sunscreen can fit you, too. It’s oil-free, noncomedogenic and dermatologist tested. I find it’s packaging nice, too. Since it comes in a pump bottle, it’s relatively easier to dispense the product without creating a mess or compromising the sunscreen. Although the product promises to provide good and long-lasting hydration, it may still not be enough, especially if you have really dry skin. Blue Lizard Sunscreen Sensitive has a creamy texture that feels soft on the skin. It glides easier than most sunscreens you can find in the market. However, similar to other products that are mineral-based, this one tends to leave a white cast, too. Despite that, it remains good for sensitive skin as it is free from fragrance. The packaging of this sunscreen is really interesting. It changes color once it’s exposed to UV rays. So, if you are unsure about when the UV rays are out, take the tube with you and watch it change to blue. One of the most common issue with this product is that it can be quite difficult to remove. For some people, using an exfoliating cloth helps. For both face and body, BurnOut Eco-sensitive Zinc Oxide Sunscreen offers UVA and UVB protection with its SPF rating of 35. It’s oil-free and chemical-free. It’s even eco-sensitive and sea-safe. The product is non-greasy and leaves a matte finish. If your skin tends to oil up, this is a great product to check out. It’s also a good sunscreen to use if you’re going to apply makeup after it. It’s a stable base for foundations as it blends invisibly to the skin. It comes out white from the tube but turns clear as soon as you rub it in. It isn’t even chalky, too. While almost all people are aware of the importance of sun protection, a lot of them still fail to follow the golden rule. And if you have sensitive skin, there’s a good chance you’re one of them. Applying sunscreen on your vulnerable skin is extremely intimidating. Any wrong ingredient can trigger redness, itching, cracked skin and a handful of other negative reactions that can instantly make you regret you even considered using it. Sensitive skin needs as much protection, if not greater, as the other skin types. Because it’s already vulnerable, exposing it to the harmful rays of the sun can give you more problems than just irritated skin. It’s not actually the application that’s causing issues. Sunscreens cause problems if you pick one that’s inappropriate for your skin type. Ideally, the best sunscreen for sensitive skin shouldn’t contain strong chemicals. Making sure your sunscreen doesn’t contain these ingredients can lessen your chances of experiencing sensitivity issues. Apart from reading a product’s ingredient list, you should also be aware of how your skin is reacting to your sunscreen. In case you develop skin breakouts, the first thing you have to do is to double check if you are allergic to any of the sunscreen’s components. If you aren’t, your next best move is to be more meticulous about your skin care. Thoroughly cleanse your skin after sunscreen use. Some products, especially those that are water-resistant, tend to clog pores and cause irritation. If you feel a stinging sensation after sweating, you may need to choose a lighter sunscreen. Apart from filters, knowing which ingredients to avoid in your sunscreen can help make selection a lot easier for you. And if you aren’t sure about that, here are 3 ingredients you should watch out for. A lot of sunscreens with gentle formulations still cause breakouts and reactions from time to time. In most cases, it’s the hidden fragrance that’s triggering reactions. People who are unaware and uninformed can easily fall prey to this, especially since most companies aren’t completely honest about their claims. The only time they’ll realize that the sunscreen they bought is scented is when they get home and get the chance to actually test the product out. Keep in mind that scents aren’t always spelled out that way. They can also appear as fragrance or parfum. ​Although the word “mineral” is very tempting for sensitive skin, it’s not what you think it is. Mineral oils have the ability to block which can put you at an increased risk of experiencing eczema flare ups. In can even lead to prickly heat. Parabens are often added to products to prolong their shelf life. Despite sounding beneficial, they really aren’t. The most troubling thing about parabens is what they can actually do to your body. For one, it can mimic estrogen once absorbed by your system. If you are still unsure about your sunscreen, you can try doing a sensitivity patch test on a discrete area of your body. In case this doesn’t give you a conclusive answer, it’s probably the right time to consider visiting your dermatologist. Having a highly-reactive skin type shouldn’t be an excuse as to why you can’t wear sunscreen. Frankly, it gives you more than enough reason not to miss it. With such delicate skin, you want to make sure it stays protected, especially from the sun’s harmful rays.